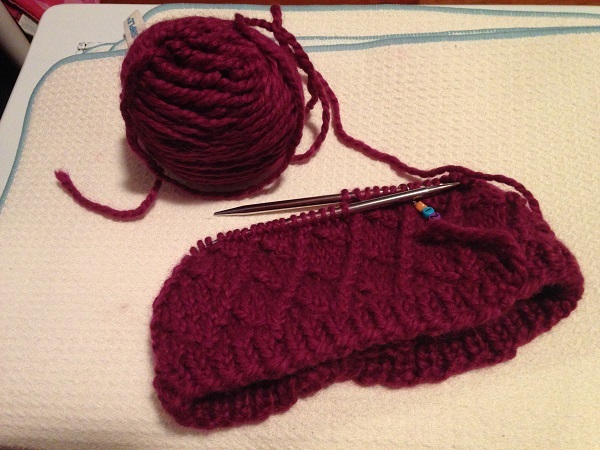 How do you know when to move on from a knitting pattern that just isn’t working? You are excited about a knitting pattern and you are excited about the yarn, but it’s not going your way. Do you keep trying? Do you try a different yarn? Do you look for another pattern to knit? Luckily (?? ), I have an example for you! A couple of weeks ago, I started the Diamond Tempest Cowl with the impossibly soft and wonderful-to-knit-with Cascade Baby Llama Chunky yarn. It had a great pattern to it and I thought it would make a great knitting class in learning how to do right twists (RT) and left twists (LT). And the yarn! Sooo great. This was completely my fault for using the wrong needle size and not checking my gauge. So, out it came and I started over, changing my needle size and checking my gauge. My gauge was a tiny bit tighter than suggested, which was okay, because that meant I would need less yarn. It also meant that my cowl would be a tiny bit smaller but that was okay too. If I had gotten the correct gauge, I probably would have run out of yarn again. In a knitting pattern there really should be a buffer in terms of yardage needed. 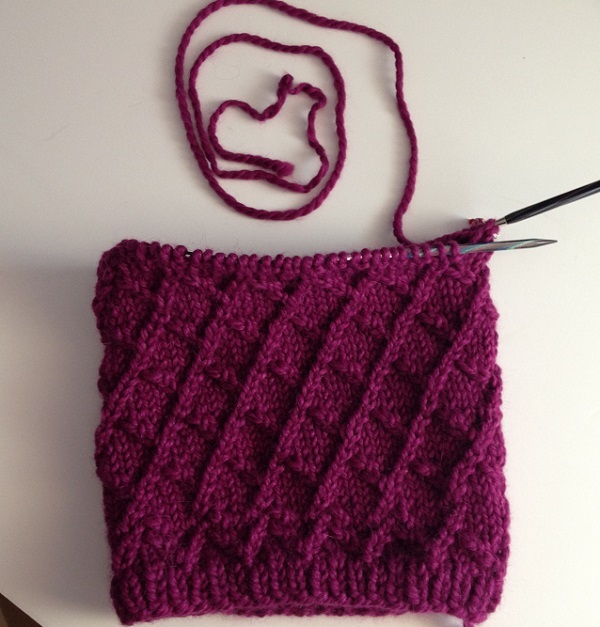 This allows for differing knitting tensions of the people working this pattern. Adding 10-15% to the amount used in the sample is a general rule. You may ask, “Why not just get more yarn?” And the reason is that this is supposed to be a one-skein project. To spend money on another skein of yarn, just to need 2-3 rounds worth is just not practical to ask students to do. At that point, I decided I had done my due diligence to make this yarn and pattern choice work together. I did not want to change the yarn I was using because I love working with it. 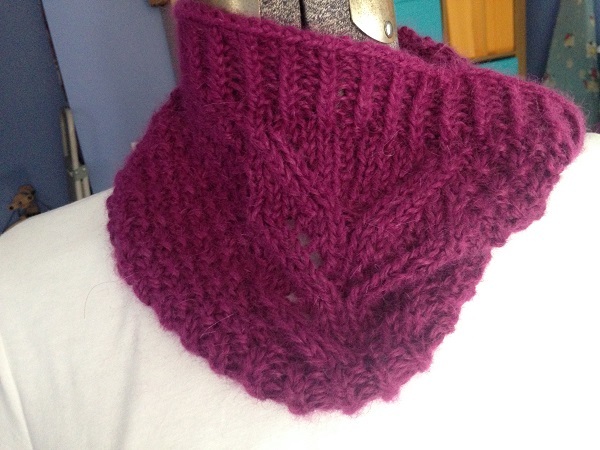 The only option was to abandon that particular knitting pattern and find another quick, chunky cowl to make for a class. The yardage needed was 100 yards, and while there was not a range in the pattern, I knew that I had a buffer with my yarn (which was 109 yards). The end result is great. It is not what I wanted starting out, but I did still get to use this wonderful yarn. 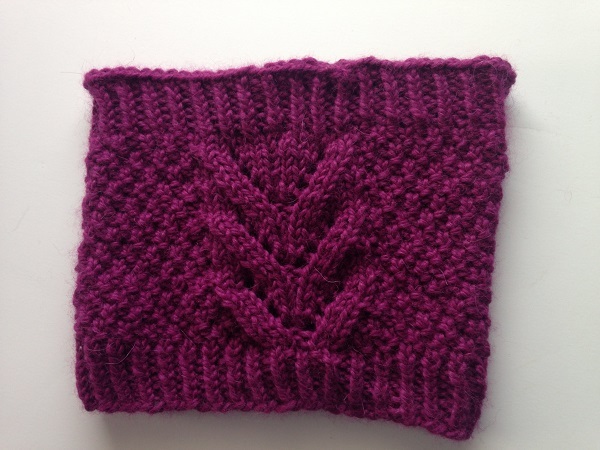 I got a wonderfully cozy and soft cowl, that was quick to knit. 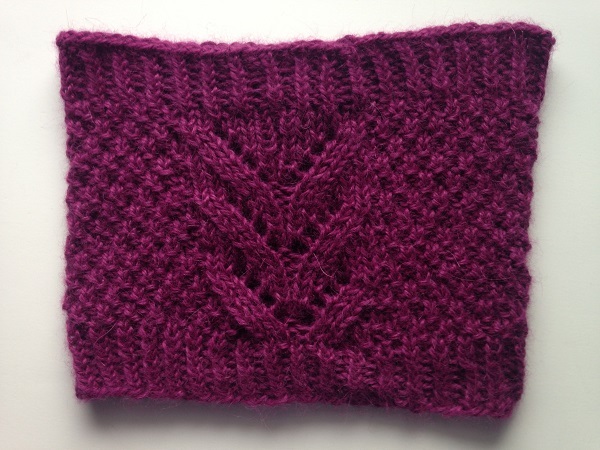 I can work the Diamond Tempest Cowl another time when I’m sure I have enough yarn! Can you tell the difference? This example is a little subtle, but you can mostly see it in the middle pattern. The diagonal sections are laying flatter and allowing the holes to open up and be shown more. Have you ever had to abandon a pattern or yarn for some reason? Posted in Uncategorized and tagged airy alpaca cowl, diamond tempest cowl on March 17, 2017 by lizytish. Have abandoned patterns before, never the yarn. You did a great job! 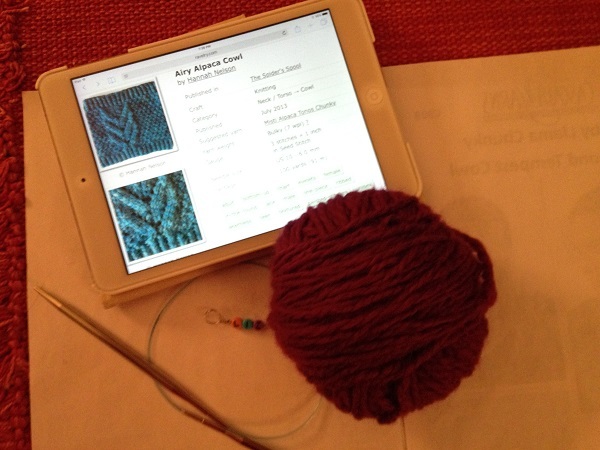 1 Pings/Trackbacks for "Knitting Lesson: Knowing When to Move On"